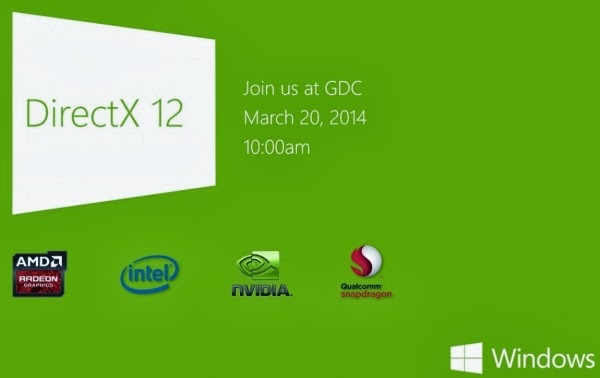 At the Game Developers Conference (GDC) to be held from 17 to 21 March in San Francisco, Microsoft will finally show its DirectX 12 graphics API on which the publisher has been working for 6 years. For the first time in six years, Microsoft will update its essential DirectX API for gaming and multimedia, as recently announced in a blog editor for its developers. And it is probably not a coincidence that this announcement comes just weeks after the launch of the AMD API Mantle. But we have to wait March 20 to get a first real glimpse of DirectX 12. This is what that day scheduled conference "DirectX: how to change the graphics platform of Microsoft" that give the director of graphical development Windows Anuj Gosalia at GDC. All information available today on DX12 is limited to summary serves presentation the intervention of Anuj Gosalia. "For nearly 20 years, the DirectX platform has been used by game developers to create the fastest and most visually impressive games on the planet. However, you asked us to go further. You asked us to give you more control over the graphics circuits and that is possible on exceptional materials. You also asked us better tools to be able to take the last drop of performance of your PC, tablet, phone and console. " DirectX 12 comes with Windows 9? Based on this description, that's what we can possibly say at the moment: DirectX 12 will no doubt bring performance gains and improve cross-platform compatibility, there are many references to the mobile world, we note the presence of the logo Qualcomm Snapdragon. Moreover, insofar as DirectX 11.1 has been included in Windows 8 and DirectX 11.2 only runs on Windows 8.1, it is not surprising that DirectX 12 is linked to the next version of Windows. The next update of Windows, code-named "Threshold" might come out in spring 2015. One can legitimately argue that the introduction of DirectX 12 could take place simultaneously. Changes in this version are significant enough to justify a "Windows 9" rather than Windows 8.2. The other question is whether Microsoft see what improvements will bring in an increasingly competitive market. Valve pushes SteamOS with OpenGL and AMD is actively promoting its Mantle technology, which precisely allows developers to have more control on AMD chips. This certainly promises improvements, but with widely varying performance. Comparatively tools like DirectX and OpenGL have been designed for all types of graphics processors. The announcement of Mantle and this question about updating DirectX probably pushed Microsoft to put forward its arguments in a "greater control of the hardware." Microsoft is not alone in show of technological tools at the Game Developers Conference. AMD released the following statement:, several articles have stated that DirectX and OpenGL capabilities would include closer monitoring hardware and help to reduce the time CPU. In terms of game development, AMD supports and maintains a cap with its design lower level, ie graphics API "offering more control over the hardware" for PC games. "While industry experts believe that it will take time, developers can immediately devise operator Mantle API design effective.